De stichting S.O.O. 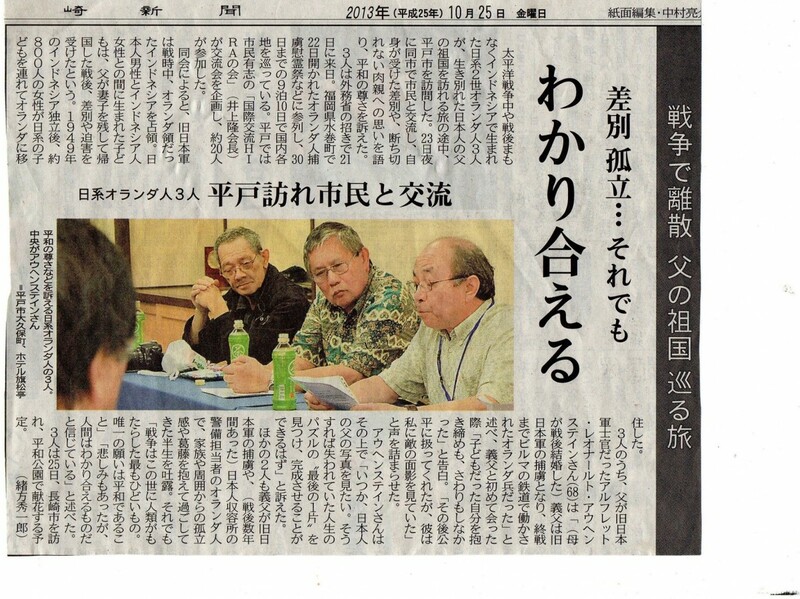 heeft dit bericht uit de Nagasaki Shimbun doorgegeven (feb 2014). An article on the 3 Japanese-Indo offspring visiting Japan. Three 2nd generation Japanese Dutch people visited Hirado city during their trip to Japan, the land of their lost fathers. On the evening of the 23rd, they met the citizens of Hirado and spoke on their discriminative experiences and appealed the importance of peace. With the invitation from the Ministry of Foreign Affairs, these 3 people arrived in Japan on the 21st. On the 22nd, they attended the memorial ceremony for the Dutch POW in Mizumaki City, Fukuoka. They are staying 9 nights and 10 days until the 30th in Japan. In Hirado, the “Kokusai Koryu Hira no Kai” (international exchange Hira no Kai, represented by Mr. Takashi Inoue), organized a reception, to which about 20 people attended. According to Hira no Kai’s explanation, the former Japanese Imperial Army occupied the former Dutch East Indies during the war. During the occupation, children were born between Japanese males and Indonesian* female. Those children and the mothers were left behind after the war and experienced discrimination and oppression. After the independence of Indonesia in 1949, about 800 Indonesian women with Japanese children moved to the Netherlands. They are to visit Nagasaki on the 25th and to pay floral tribute at the Peace Park.